In Samford University’s School of Health Professions, students are empowered with confidence, compassion and knowledge by the school’s commitment to exposing them to a variety of population-based specialties. 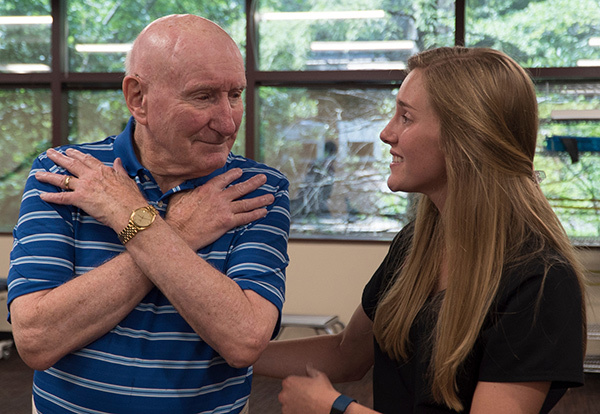 This summer, Samford’s Department of Physical Therapy partnered with Danberry at Inverness, a retirement community near Samford’s campus, for a project that was initiated by one of Danberry’s residents. Earlier this spring, associate professor Scott Bickel met with Hank Boger, a resident, and Cleo Clency, a staff member from Danberry. Boger, a man in his 90s, had started his own research project, using a piece of equipment to try to predict a person’s need for a walker, wheelchair or cane. So the project began. Bickel and assistant professor Sarah Ross took the 2018 Doctor of Physical Therapy cohort, then taking a geriatrics course, to Danberry to conduct physical performance assessments in coordination with a wellness program organized by Danberry. Thirty-five Danberry residents volunteered to take part in the pre-assessment work. The majority of these tests were used to determine a fall risk prediction. A “six-minute walk” tested a person’s endurance, and a “timed up-and-go” worked to evaluate one’s balance. While no single test can determine a person’s risk of falling, cumulatively, students are able to provide a prediction based on the overall results. This project gave students hands-on experience with older individuals, conducting tests similar to ones they might see in a clinical setting. “Long term, we would like to do projects like this regularly. It provides good experience for the students, and it’s good for the volunteers. Plus, it would be great to go back next year and see how these same people have improved or declined,” Bickel said. For some students, the experience confirmed their calling to work with the aging generation.